Using the Relief module you generate and process free-form surfaces, coin reliefs and shapes for engraving / milling applications. Here gridded relief data is processed in the relief format as ordered scatter plot. Relief data are built up similarly to the gridded printed design data such as PCX, BMP, TIFF … The Relief image consists of individual dots arranged in columns and lines, the pixels. Each pixel has a height value (Z information) assigned to it. In the various graphical representations this height information is drawn as colours, grey shades or curves. With this, a pixel is the smallest presentable element in the Relief. If intermediate points are required for projections, conversions or for milling, then these are interpolated The reliefs can be edited, scaled, filtered mirrored and converted into optimum milling tracks via various milling correction processes or employed as projection basis for the representation of 2D or 3D paths. processing of reliefs, digitalised data, surface formats, photos (Relief). generation of reliefs from graphic elements (ReliefVTR). generation of milling data from relief (CAM) (Relief AutoCorr). Point of emphasis for the relief format are artistic workpieces with many fine details and relatively flat characteristics (coin relief). Here lies the particular advantage of a simple and compact representation. Technical shaped parts have, on the other hand, rather uniform, in part, also very steep surfaces with few structures. For this surface descriptions (solids) are rather more suitable. With limited number of individual surfaces very compact data. The surface support points can be specified precisely. Depending on the CAD the surfaces can be freely edited. Simple representation of very fine artistic tasks. With many fine details a relatively compact relief is created. Digitalised data can be simply converted. Universal, rapid and exact milling correction processes for almost any desired tool shapes. Digitalised points have in part to be converted very laboriously via reverse engineering. Comprehensive tasks with very many details are, in practice, barely controllable. Milling offset calculations are, as a rule, limited on spheres. Surfaces must be gridded and can be passed on only with the accuracy of the grid resolution. Limitations with shapes with steep flanks. Because with equal grid resolution the relief data quantity with the dimensions increases immensely, the grid format restricts itself rather to smaller workpieces. Exchange of vector data (paths) between relief and CAD. If vector data (paths, contours, stretches, points) are required in the Relief module, then these are to be generated and marked in the CAD and are to be adopted in the relief module. In the relief module the paths marked in the CAD are shown in the colour greenish-blue. On the other hand paths, which have been generated in the relief module, after leaving the relief module, are adopted marked in the ActLayer. 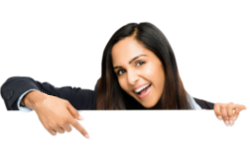 In the CAD, paths can be very easily drawn on the relief in the background after the option Relief has bee activated in the aid Graphic Background. Graphic ZOOM +: enlarge image. Frame a section of the image using a rectangle and present enlarged. After clicking-on using , depending on the module, you obtain a zoom selection. Graphic ZOOM -: reduce image. Redraw the image at half size. Graphic image NORM: image at set limits. 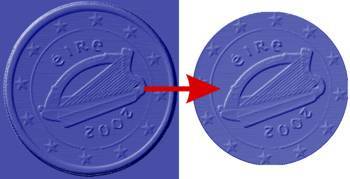 Standard grey image: Adjust standard grey shades (colour) relief image. The colour table can be modified under Colours. The graphic indicator is activated by clicking-on Standard grey imaged and Adopt.. Contrast dz-graphic: Relief plan view with accentuation of finer details. The contrast levels can be set in the range 1..5. Render: Display rendered the relief graphic with firmly fixed illumination source. Relief Object: Indication of the object limits (vector data). The display is switched ON and OFF by clicking-on. Clipboard: Display of the vector data of the clipboard (,marked paths). The display is switched ON and OFF by clicking-on. Colour: Adjustment of the colour table for the relief image presentation. Various standard palettes are available (Grey stairs .. chocolate) and a free adjustment using variable colours. Redraw image with current settings. Show ail graphic components (also outside the limits). If you have questions on the operation, then please first use the integratedHelp.You can access Help also with already activated function using or using the aid ? Help and clock-on the function. All operations are actioned using a layer of the ActLayer (current or active layer). The selected layer is selected here. 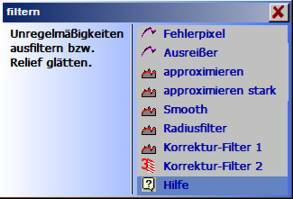 Load and save relief data formats, images and CAD or digitiliser data in this menu. The functions in this menu always load only one complete relief and, with this, delete the previous relief content. Packed (.HRP) or unpacked relief data (.HRL) are loaded from a file in the working storage. For the differentiation of the data formats see Save Relief. Save the relief data in a file. To save you can select the two data types HRP and HRL. HRP The Relief is saved in packed format and with this requires less room on the data carrier. HRL The relief is saved unpacked. This is, for example, required for data exchange with older programs and for further application, e.g. 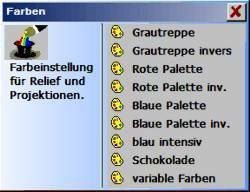 integration in ReliefVTR. Foreign formats can be converted into a relief using Relief Import. STL is a stereo lithography format from the firm 3D-Systems. ASCII- and binary files are accepted for import. The measurement is always understood to be in mm. Advantage of STL is the clear definition and with this hardly any problems are to be expected with import. For good surface qualities you should pay attention that the surface is as highly resolved as possible and saved with small tolerances. The STL data should as far as possible be available in the processing position. If this is not the case, then you can rotate the STL surfaces before generation of the relief. The shape can be rotated about the X, Y and Z axes in the range -180°..+180°. Rotation takes place in 5° steps by clicking-on the buttons left and right alongside the angle indicators. Alternatively, the respective last rotated axis can also be rotated using the mouse thumb wheel. More accurate inputs are possible in the numeral field through manual input. Angle XY Horizontal rotation of the shape about the Z axis. Angle YZ Rotation of the shape about the X axis. Angle XZ Rotation of the shape about the Y axis..
Volume aspect The graphic 3D display can be matched to the respective requirements. The following can be selected: the linear projection (vector graphic), relief projection, render projection or a combination of linear and relief or render projection. The projection shape shown in black is set. The blue listed projection shapes can be selected. Standard setting is linear + render projection. Following confirmation of the position the relief data is displayed/edited. As a rule the proposed values can be adopted unmodified. A modification of the data is recommended in individual cases only. Note: Depending on the quality of the surface generation, STL data can contain gaps (imperfections). These imperfections are mainly caused by the type of design (e.g. through the joining together of surface boundaries using arcs and segmented lines (polygons)). Small imperfections in the area of a relief point around a STL segment are closed automatically by the program. Larger imperfections. after an import, must be removed by filters or manually. A suitable filter for closing STL gaps is Correction Filter 2. Zero point X0, Y0, Z0: Relief limit bottom left. By displacing the zero point in X/Y and enlarging the relief dimension, a border can, for example, be generated around the part. Width (X), Height (H), Depth (Z): Relief dimensions. By displacing the zero point in X/Y and enlarging the relief dimension, a border can, for example, be generated around the part. Resolution dx/dy: Grid resolution for the relief conversion. Smaller resolution values result in a larger relief data quantity and with this, longer calculation times. The proposed resolution, as a rule, surfaces for very fine work. 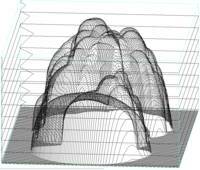 Read-in of DXF data with 3DFACE surfaces. These data are, for example, generated using the Roland Picza digitalising machine. Attention: Here only files with 3DFACE surfaces are read-in correctly-. Standard 2D or 3D DXF data are not suitable for this import and you obtain no result! In cases of doubt please check your data using a suitable editor or CAD. BMP Windows Bitmap with 256 grey shades. gif CompuServ Bitmap with 256 grey shades. The gif -format contains no information on size or resolution. The image dimensions must be adjusted manually after import. PCX Paintbrush Bitmap with 256 grey shades. jpg, JPEG JPEG Bitmap with 256 grey shades, 8Bit colours and 24Bit colours. jpg images with 24Bit colours are converted into a grey shade image on import. A photo should be processed into a photostyler (e.g. 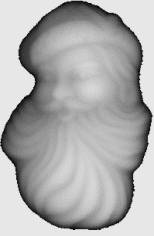 Corel PHOTO-PAINT) before the milling path calculation and saved as grey shade image (8Bit/pixel – not in colour, exception .jpg). Images in .jpg format can also be saved as colour images (24Bit). These are converted into grey shade images on import. Gridded photos (e.g. from journals/magazines) posses a very rough surface and should as far as possible be avoided or reworked into a suitable photostyler beforehand. Gridded images can also be improved using approximate finely/strongly. The formats BMP, PCX, jpg and JPEG are imported already with the correct image dimensions. You can adjust the measurements in the following input. gif images have no resolution or image dimensions- These images must always be adjusted correctly. The relief Status is also displayed as check for the input of the relief dimensions . Proportional [Y/N]: With the setting YES all axes are also adjusted proportionately at the same time. The height – width – depth ratio remains the same. With the setting No the axes X/Y/Z can be determined individually. Dimension XY/Z [mm]: Relief dimensions in the axes X/Y/Z. Convert and save the current relief in various foreign formats. STL is a stereo lithography surface format of the firm 3D-Systems. For export STL binary files are created. Export processes with increased surface number. The surface is formed through adjoining triangular surfaces and is closed free of gaps. The max. permissible deviation to the relief is determined through the input tolerance. A large tolerance results in compact data with few STL surfaces, but large deviations to the relief. A small tolerance results in extensive data with many STL surfaces but also no deviations to the relief. The tolerance should not be selected too fine, because the therewith resultant surface number exceeds the potential of many target systems (CAD/ CAD). Tolerances < 0.01 mm should not be selected. For large relief enlargements the tolerance should lie significantly above this (0.05 .. 0.5 mm). Export of the current relief into a DXF file using 3DFACE surfaces. This file can, for example, be read-in using AutoCAD. The surface is formed through adjoining rectangular surfaces. The max. permissible deviation to the relief is determined through the input tolerance. A large tolerance results in compact data with few STL surfaces, but large deviations to the relief. A small tolerance results in extensive data with many STL surfaces but also no deviations to the relief. The tolerance should not be selected too fine, because the therewith resultant surface number exceeds the potential of many target systems. Tolerances < 0.01 mm should not be selected. For large relief enlargements the tolerance should lie significantly above this (0.05 .. 0.5 mm). Save the relief as grey shade image (256 shades) in BMP format. Indicate characteristics and dimensions of the relief file. The Z coordinates process positively upwards (opposite direction to LG1 format). File size [kB] : Size of the file in kByte. Dimensions X*Y*Z [pix] : Measurement of the relief in dots. Enlargement X*Y*Z [mm] : Enlargement of the relief in mm. Left below X*Y*Z [mm] : Relief limit bottom left. Right above X*Y*Z [mm] : Relief limit top right. Scaling X,Y,Z : Scaling factor for X, Y and Z. The functions in this menu always load only one complete relief and, with this, overwrite the previous content of the working storage. If a relief or part of a relief is to be imported to an existing relief, then this can take place using ReliefVTR . Input relief. In many cases the relief to be imported must be prepared for this purpose. For example, if the r is to be with any desired contour and not limited to rectangular. Using Input relief fundamentally all unpacked reliefs (.HRL) can be imported. The relief may not be packed for input. Extracts from reliefs are generated using the following functions Export extract and Export frame. Generate a rectangular or ellipse shaped extract from the current relief. The extract can be exported in a file or adopted as current relief. The relief extract is first limited by the two values, zero position and end position. The extract can be further limited in the following selection. Limits: A rectangular or an ellispe-shaped extract can be generated. Width, height: Input of the desired width/height of the extract. x0 left, y0 below, x1 right, y1 above: Positions of a boundary rectangle for the extract. mm, Pt centre: Dimensions in mm, relief point centre. Pix. : Dimensions in relief dots. Export file: The extract is saved in a file. Replace act. relief: The current (active) relief is replaced by the extract. An extract from a relief, which lies within one or more frame contours, is exported. The parts of the relief which lie outside the frame contour, are faded out (do not overwrite the existing relief on importing). The frame is to be designed and marked in the CAD beforehand. 1 In the CAD draw one/several boundary contours. For this you can place the relief in the background using the aid Graphic background. 2 Mark the boundary contours and change into the relief module. 3 Select relief File . Export frame and the boundary contours. 4 Save the relief limited using the boundary contour in a file. Extract XY: Create a relief extract. The area of the image to be framed by a rectangle is adopted and the rest is removed. For easier input of the boundary rectangle you can draw help lines beforehand in CAD. Add border: Create an additional image border. A border in the specified width is inserted around the relief. Border width: Width of the border which is to be added to the relief. YES: For the border the outermost pixel is duplicated outwards. No: The height of the border is determined using Border level. Border level (L): Height of the borders with Same level = No. Limit above/ below: Limits the relief in Z (cut off relief top/bottom). For Z value input, first select a suitable (Z) point using the cursor in the relief. The Z level can be corrected to the desired value in the subsequent input. Capable of input are only values between minimum and maximum relief Z values. Following confirmation the relief is appropriately limited. Scale % Adjust size in X/Y/Z (input in %). Change of the scaling between 1% and 10000%. Values of 1%..99.999% reduce the image, Values 100,001%..10000% enlarge the image. With Proportional = YES all axes are the same, with No the axes are input individually. Dimensions XYZ: Height-width ratio (input in mm). With Proportional = YES all axes are the same, with No the axes are input individually. Reduce %: The image data are coarsened, i.e. image dots (pixels are removed and thus the resolution and the amount of data are reduced. Image data are modified through this function! Reduce mm: The image data are coarsened, i.e. image dots (pixels are removed and thus the resolution and the amount of data are reduced. Image data are modified through this function! Dimension XY: Coarsening value only smaller than the indicated value. Grade: Coarsen grey tone (colour) grading: the grey tone table is converted to another grading. This function is only sensible for a coarsening of the grey steps. Display grid in Z: display the grey tone grades. Input shades: new number of grey tone shades. Double resolution. : Double resolution of the complete image in X/Y. The position and enlargement remain unchanged. Match the relief to the working limits or working limits to the relief. Max. graphic: Match image frame to graphic. The image limits are so adjusted that the graphic fills the complete image. Centre graphic: Centre the graphic within the limits. The graphic is arranged centrally within the image frame. Centre frame: Centre graphic an limits. The graphic frame and the graphic are so displaced that the centre of the frame lies at the point X = 0 and Y = 0. Displace: Displace graphic. The relief is displaced using the cursor. With this a frame is also moved. Using the key the relief is adopted at the momentary position, using the key the function is aborted without an adoption. The relief can be displayed in 3D in several versions. The type of presentation (gratings, vectors, dots or surfaces) is selected with the topmost buttons. The viewing direction is displayed schematically by means of a cuboid. You can adjust the direction by clicking-on the direction arrow in steps of 10 degrees using the cursor. Using PosnA adjust the line depiction colour. With PosnA without colour the perspective display takes place with adjustable height level marking. Following the graphic is drawn, aborts the input. For display of a section (Zoom) select Zoom projection. The selected section is defined, using the cursor, through the two extreme positions of a rectangle (zero position and end position). One after the other both positions are input using the cursor. A position is confirmed with the key . If the key is operated, then the function is aborted and the image remains in its original condition. Following confirmation of the end position the image is deleted and the projection drawn anew enlarged. Before Zoom projection the image must have been adjusted using Norm projection. Scan of boundary lines for a selected Z level relief. The lines are determined as vector data. Following the selection ABSOLUTE/relative, a point is selected in the relief at the desired height. Adjust layer edge Absolute height representation Relative height representation. ABSOLUTE: Scan all contours at a height display. Relative: Scan all contours at a gradient acclivity. For this the relief is converted temporarily into a height representation using relative acclivities. The level at which the boundary lines are scanned, must be selected beforehand using the cursor. The coordinates in X/Y/Z for this are displayed in the input line. In the following editing the level can be corrected or adjusted upwards or downwards. Adjustment for layer edge. Relief section at level height. Relief using the traced contour. Thicken: Thicken the traced contours up to max. 10 times relief resolution (pixel). Level: Limiting height for the edge scan. The level can be edited in the range from min .. max (display above). For orientation a b/w image with the momentary limit set is also drawn at the same time. You can rework the relief and achieve flatter surfaces and/or filter out irregularities using the filter functions. Filters are mostly required for import data, e.g. import of dot clouds: Digitalising imperfections must be removed (error pixs, outliers, approximate). Or following import of STL data: gaps must be frequently be evened out (correction filter 2). The filters can also be called up several times for a stronger effect. Error pixels: Individual dots are filtered. This has an impact only locally within a radius of one image dot, i.e. no appreciable change of quality though smoothing of the surface. Max imperfection (0.01..10mm): The image dot (pixel), whose value deviates from its neighbouring dots by more than the specified max imperfection, is approximated (adjusted). An image edge of 1 pixel is not processed. Outliers: The function outlier is the special surfaces filter for the removal of individual intensely different image dots (outliers) independent of their value. This filter has an impact only locally within a radius of one image dot, i.e. no appreciable change of quality though smoothing of the surface. 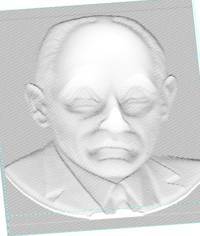 Approximate (strongly): The image contours or shapes are smoothed through approximate and approximate strongly . Approximate can, depending on requirement, be carried out several times. Smooth: The relief resolution is doubled and, at the same time, the relief slightly smoothed. This filter produces significantly higher data quantities and should therefore be used for coarse images only. Reliefs with too high a resolution can be reduced again using scale . reduce (e.g. : [%] = 50). Correction filter 1: Smooth the relief, all edges are rounded one-sided. Imperfection radius (Ir): Half of gap width to be filled. Fill (flat/circular): Gap flat ,fill, spheroidally. Exact: Complex and error-free calculation. 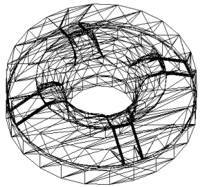 Pointed: Rapid calculation for lightly curved surfaces..
Mirror the complete relief in X, Y, Z or rotate by +90 degrees / -90 degrees. Mirror X/Y/Z: The relief is mirrored about the selected axis. Counterblock XZ: Concurrent mirroring for a counterblock in X and Z direction. Rotate +90°/-90°: The relief is rotated by +90°/-90°. Milling data generation from Relief. The program supports various milling data calculation from Relief: the fully automatic Relief Auto correction and the Z constant roughing. Complete milling data for up to three tools using a series of milling strategies can be generated very easily using Relief AutoCorr. For this set the tools, calculation process and milling strategy and start the calculation. Relief AutoCorr can be employed for the calculation of milling paths for the complete relief or for milling paths within closed contours. If the calculation for a part of a relief take place within contours in CAD, mark these and change into the relief module. The marked paths are now displayed in the colour greenish blue. If Relief AutoCorr is started with marked paths there are other milling strategies available. For milling path calculation the relief is always placed with the highest point at Z = 0, independent of whether milling paths lie at this point or not. The finished milling data should always be checked using Norm/ZOOM projection and can then be output directly using Export PLayer. Alternatively you can copy the milling data into a graphic layer using PLayer > Target layer. This is then sensible if this milling data is to be combined with other milling paths. uncorrected relief as projection basis for engraving data. The relief is provided in the following menus: Relief File, Edit Relief and ReliefVTR in order, thereafter, to project 2D or 3D milling paths on to the relief using projections. Automatic generation of complex milling data for several tools via the Relief Auto correction as well as some special milling processes for the processing of layers (see below). Using the function the complete roughing and finishing tracks are calculated according to several selectable processes for up to three tools for the milling of a relief. If contours have been marked previously in CAD then these are employed, otherwise the relief boundary is used as milling limit. The inputs take place in columns: left (coarse roughing), middle (fine roughing), right (finish). For the track calculation the tools can be combined. The input fine roughing is only possible together with coarse roughing and finish. Coarse roughing: Using the tool as much material as possible is removed. For the finished relief at least one finishing movement must always be held back because for roughing, residual layers remain as security for the finish-machining. Finishing: Finish-machining of the relief using the finest tool. The resolution of the milling data (minimum support point separation) is calculated from the track separation (CuT+CuCFrK) * Tracksep / 100 and limited through the absolute minimum relief resolution (in X or Y). Settings for milling path calculation. Tool #: Number from the tool library [0..199]. The number -1 switches the calculation OFF. For the calculation the following combinations of the processes are permitted: roughing only coarsely, only finish, roughing coarsely and finish or all processes together. The cutter tip radii (CuT + CuC) must be input in descending order, i.e. for roughing the larger, for smoothing the finer tool. The tool input can be opened using or through a click on the tool graphic. Clearance process: Surface milling processes see selection. If contours have been marked previously in CAD then these are employed, otherwise the relief boundary is to be used as milling limit. Which type of clearance is possible is indicated in the selection. For roughing the rectangular spiral is available. For finishing this is replaced by an optimised line milling process. Inwards: The milling tracks run from inside outwards. Outwards: The milling tracks run from outside inwards. Clearance track separation[%]: Separation of the milling tracks dependent on the cutter radius f(CuT+CuC). With 100% track separation it is worked with an offset of CuT+CuC. Layer separation Z (1st track): Milling depth setting for the 1st track. With clearance direction outwards a border is milled in layers around the relief (free-mill relief). The setting always takes place relative to the cutter used (CuT + CuC), i.e. with the setting 100% the cutter dips into the material per track with a max. depth, which corresponds with the cutter radius. Typical settings are 10% .. 150%. For easy to mill materials also 151% .. 998%. The setting 999% switches the precalculation of the 1st track OFF. In most practical cases, the calculation of the 1st track is necessary for the first tool only. For all other tools this calculation can then be switched OFF. Only in special cases, e.g. the first tool in narrow areas does not achieve the necessary depth, is the switching ON of the 1st track necessary for a further tool. Clearance layer number(1..99): Number of the desired layer levels from upper edge of relief down to relief base. The parameters of the relief AutoCorr. Incision angle: Angle for the incision (dip) movements into the material. In order to spare the tool engagement should be as inclined as possible. Input range = 5° .. 90°(vertical). Typical value: 30°. Finish offset: The roughing tool (roughing coarse + fine) allows a minimum material thickness to remain. Input range = 0 .. 10mm. Typical value: 0.1mm. Spiral resolution: Vector resolution for circular spirals. Spirals are vectorised for 3D processing. With circular resolution = 0.1° a variable circular resolution is created (dependent on the momentary radius). Circular spirals are fundamentally rounded off outwards. YES: Following milling correction the relief is refined for a better surface quality. This setting somewhat improves the surface quality. If extremely steep edges are to remain unchanged in the relief. then this parameter is to be set to zero. No: The relief remains unchanged. YES: With milling the tool leaves out plane surfaces at the uppermost level (depth 0). This is only sensible with a relief with large plane surfaces which are not to be milled..
No: The complete relief is milled (coin relief, without tool interruption). Accelerateroughing calc. : The calculation for the roughing tool is considerably accelerated with YES. If steep areas, for example, are already finished-milled using the roughing tool because the finishing tool with larger flank angle can no longer reach this position, then this parameter must be set to zero. Projections tol. 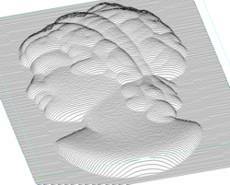 (0..0.1)[mm]: Reproduction accuracy for the generation of milling data. Sensible values for high quality milling are tolerances <=0.002mm. For simple tasks one can also work with a tolerance <0.05mm. For woodworking for example a tolerance 0.05 .. 020 suffices. 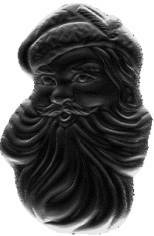 With the setting 0 the relief with the highest accuracy (best quality) is reproduced. Here, however, you obtain a very high data density which simple machines cannot process without problem. Relief roughing calculation in layers. Tool number: Number from the tool library [0..199]. The number -1 switches the calculation OFF. For the calculation the following combinations of the processes are permitted: roughing only coarsely, only finish, roughing coarsely and finish or all processes together. The cutter tip radii (CuT + CuC) must be input in descending order, i.e. for roughing the larger, for smoothing the finer tool. The tool input can be opened using or through a click on the tool graphic. Number of layers (S): Number of desired layer (contour) levels from upper edge of relief down to the relief base. Track separation f(CuT+FrK) (A): Separation of the milling tracks dependent on the cutter radius. Continue relief edge Y/N: The input is dependent on the relief shape. Yes: The relief is enlarged about the tool radius. For embossed reliefs. In this way the program generates milling paths beyond the work piece limits. No: The relief dimensions remain unchanged. For recessed reliefs. Hatching angle(An): Gradient direction of the linear hatching tracks. YES: The hatching contours are also saved at the same time. No: Only the hatching lines are saved. YES: Creation of contour parallel clearance tracks. No: Creation of linear clearance tracks. Roughing offset Z: Safety offset of the milling tracks to the relief. The parameters for Z constant roughing. Incision (dip) angle: Angle for the incision (dip) movements into the material. In order to spare the tool engagement should be as inclined as possible. Input range = 5° .. 90°(vertical). Typical value: 30°. Roughing quality: Contour constancy of the roughing paths, Setting 1: very fine … 6: very coarse. Presetting = 3: fine. Perspective representation of a 3D milling data set. The milling data is displayed in perspective. The perspective angle can be adjusted using the 8 direction buttons. With the setting in plan view (all angles = 0) the 3D paths are displayed in grey (colour) shades. PosnA = grey: Perspective view with height level marking. The paths lying above the levels entered are displayed black, the paths lying below grey. Free movements are not marked. OK: The graphic is generated using the adjusted data. Enlarged 3D view of the projected cutter centre tracks (Zoom). This function is used following Norm Projection. The calculated milling paths are adopted in one layer. For this a target layer is to be input. With the aid of this function 2D and 3D milling data can be combined in the layers and output using File . direct mill into a project. To save in one layer select the target layer using layer selection. If there is already data in the selected target layer, then milling data can also be loaded into the target layer or the existing data can be overwritten. The milling tracks calculated using Relief AutoCorr are exported. For this goto Export selection. with the aid of this direct export milling data can be issued very productively without detours to the machine.